What does media visibility look like for law firms in the digital age? The answer is as diverse as the myriad issues law firm thought leaders address at any given moment and the media outlets, niche blogs, and industry publications that rely on such analysis and commentary as they deliver the news to their own readers. An article by Brad Kuhn at Nossaman about SB 901 and wildfire cost recovery was referenced/linked in a Fox 11 news piece, Report: State regulators investigating SCE regarding Woolsey Fire. 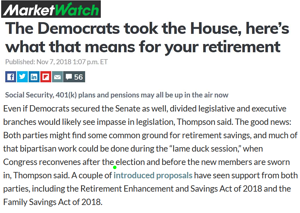 Commentary by Alisha Sullivan at Robinson+Cole about retirement reform was referenced/linked in a MarketWatch article, The Democrats took the house, and here's what it means for your retirement. An update by Leslie Palma at Holland & Knight on Mexican legislation regarding collective bargaining was referenced/linked by The Hill in an op-ed piece: A North American road to the middle class. A Mintz Levin review of recently unsealed whistleblower cases was referenced/linked in a Policy & Medicine article, Government Intervenes In Select Few Qui Tam Suits. Analysis by William Craven at Cozen O'Connor of a case at the intersection of cryptocurrency and insurance was referenced/linked in a related article on Crypto Briefing, Bitcoin Insurance: It May Be Covered By Your Homeowner Policy. A Hogan Lovells alert on a public hearing scheduled by the FDA was referenced/linked in a news brief by Becker's Hospital Review, FDA schedules hearing to discuss solutions to drug shortages. A tax update from Eversheds Sutherland was included in a regulatory wrap-up by Chain Store Age, The Business of Retail. Commentary by Ryan Baron at Best Best & Krieger on the rise of CCAs and the California electric business was referenced/linked in a related post by Greentech Media, San Diego Moves Ahead With 100% Clean Energy Community Choice Program. An update by Aaron Milrad at Dentons on Canadian copyright revision under USMCA was included in a business news roundup on Canada's FYI Music News. An Eversheds Sutherland update on FINRA disciplinary actions was referenced/linked in a BAI Banking Strategies article, Why compliance is no excuse for being dull on social media. A piece by Igor Gorlach at King & Spalding on Anthem Inc.'s HIPAA settement was referenced/linked in a related article by Healthcare Business & Technology, Anthem's $16M data breach: what your hospital can learn. Analysis by Nancy Halpern at Fox Rothschild of a lawsuit involving legal standing for animals was referenced in an article by BEEF magazine (a publication for the cattle industry), How animal rights activists use politically correct social justice law to achieve their goals. An update by Kelley Drye & Warren about the EEOC's sexual assault claims became the basis for a report in The HR Advisor, EEOC Says Sexual Harrassment Claim Numbers Up. *This sampling of recent media visibility does not include the regular use of JD Supra clients as background sources when reporters and editors reach out directly for subject matter experts while researching their news stories. For more information, see JD Supra results: Media Attention. Have questions? We're here to help. Shoot me an email or schedule a call.